Beijing and Shanghai are by far the most populated cities in China, and the most popular tourist destinations. But to spend a week in Shanghai without venturing to nearby places like Suzhou and Hangzhou is to miss out on a great experience. 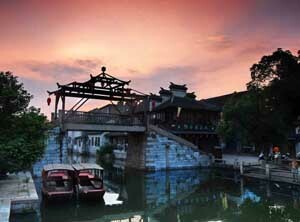 Suzhou sits about 50 miles northwest of Shanghai. With a population of about six million, it’s not nearly as huge as Shanghai, Beijing, or even Hangzhou. It’s known for its peaceful gardens and waterside canal towns where people live today as they did in generations past. But there was one important commodity that has made Suzhou a successful city throughout the ages—silk. Known over the centuries for both its silk production and fine silk embroidery, silk is what put Suzhou on the map. That, and the gardens, which date back to the Ming and Qing dynasties. We woke early, enjoyed an enormous breakfast at our hotel: The Suzhou Metro Park Hotel. After a breakfast of eggs, sticky rice, and jellyfish “noodles,” we decided to start with the soft stuff: The Number One Silk Factory. We learned about the production of silk and saw each step firsthand. Our guide took us from the raising of the silkworms in different types of habitats to the cultivating of mulberry bushes to feed them. From the boiling of the silkworms to how the silk is pulled from multiple silkworms at a time to form one barely visible strand. We also saw how some bigger silkworms are used differently, to create comforters and pillows—instead of pulling a thread of silk, the silkworms are pulled open on a stick, then a bigger one, then each single silkworm is stretched open to the size of a blanket. We even got to pull open one of the silkworms ourselves. These larger silkworms used to be thrown away because the silk strands couldn’t be pulled off like string—until a lady figured out how to use them and these “rejects” became even more prized than “normal” silk worms. After the silk production factory, we visited Suzhou Lanli Garden Embroidery Research Institute, in an area surrounded by beautiful mountains. There, we viewed original, million-dollar silk embroidery works of art, and witnessed the process of embroidering silk into masterworks. We took in a number of different styles. For example, the double-sided works with different pictures on each side or figures that are different colors on each side, using the same stitch work. It was amazing to see the nimble needlework of the masters as they worked with multi-colored thread (one color on each side of the silk strand) so thin it was nearly invisible to the naked eye, to create two intricate pictures in one. One work that impressed us was the portrait of a tiger who looked as clear as a photograph. When we rotated the center of the frame around to the other side, the same picture was there. These were not two of the same picture duplicated—it was the same picture in reverse, the needlework so masterful that it created twin copies of the same portrait at once. Another amazing example was the two-sided image of a cat toying with a cricket. On one side, the cat is gray. On the other side, the identical picture can be found, but the cat is orange. These were not two works of embroidery matched up—it was the same thread with one side of the silk colored gray, the other orange. It was astounding that the embroidery masters could accomplish such a feat. They do it every day. After the silk production tour and silk embroidery institute tour, we were hungry. We took lunch at a local farmers’ restaurant, which was quite good. As with most of our lunches, an assortment of many kinds of food was placed on a lazy susan for us to share. As we ate, our guide pointed at one of our waitresses. We nodded politely, expecting the awkward moment to pass. Mr. Single leaned in, seeming more interested in these morsels of information than the morsels of pork, chicken, and broccoli on his plate. Suzhou is known for its network of canals, stone bridges, and waterside houses with cement and stone porches that literally fall into the narrow waterways. This is how locals have lived since the sixth century B.C. Most of the millions who live in Suzhou today live outside this center, in modern housing. But those who still live here still live a simple life in the traditional way. As our boat carried us through the narrow waterways, we saw people doing their laundry on scrub boards where their patios dipped into the canal. We watched people hanging laundry to dry, hanging out meat, and putting breads and baked goods in their windows. People stood on the stone bridges and took pictures of us as we took pictures of them. A man held up his baby to wave at us and we waved back. Girls sitting at a café and reading books looked up and waved, smiling. Vendors sold newspapers and nylons, food and tools. We even saw a wedding party, the bride and her bride’s maids all dressed up, two boats along the canal waiting for them, decked out with white flowers. The bride and her ladies giggled and waved. Picturesque and peaceful, but feeling more authentic than touristy, we enjoyed the sights—and the sights enjoyed us—as our boat carried us through the canals, under stone bridges, passing the homes and markets of the local village. We came to a 1,100-year-old street in old Suzhou, and got off the boat. We visited the crowded streets of an old famers’ market where just about any animal you could want to eat (and a lot that we didn’t want to eat) was available for sale, dead or alive: snakes, turtles, frogs, fish, chickens, geese, pigeons, various birds, and all sorts of creatures big and small. We watched a butcher kill a chicken right in front of us by hanging it off its own cage. They don’t cut the necks because they want to keep the blood in the chicken—it’s good for warming the body and the liver, locals say. It was easy to feel sorry for the animals, frogs piled on top of each other, chickens caged so tight they couldn’t move, eels in mounds that made it impossible for them to move. But it wasn’t that the local farmers were crueler than the western meat complex—just that they were more transparent. The animals cleanly and conveniently packaged in American supermarkets likely endure the same indignities and suffering—or far worse. We’re just more interested in hiding it from consumers. Within the old farmers market, we visited a 100-year-old winery. The label has been in business here for more than 100 years, and the current wine master has been making and selling the family label all his life. While there, we sampled four different kinds of sticky rice wine. They called it wine, but it was more like a liquor, slightly sweet and made out of fermented white rice in large clay pots. The wine master dipped a silver ladle into the clay pots to distribute our samples. They were different ages—from three years to 30—and had very different tastes, from smooth and sweet to harsh and strong. When we purchased a bottle to take home and our guide bought a jug of the “fire water” to take with us to our next dinner, the master used the same metal ladle to dip into the clay pots and pour into specially made plastic bottles. The bottle our guide purchased for dinner ended up lasting a few meals. After taking in the famers market, we took a canal cruise back to the mainland and visited the Lingering Garden. What a refreshing and peaceful place to linger. Covering an area of 23,300 square meters, Lingering Garden is also the largest classical private garden in China. It was built in the Qing Dynasty style. We explored the full gardens, pond, bridge, willow trees, island, flowers, mosaic sidewalk pictures, display rooms, halls of bonsai trees, and more. 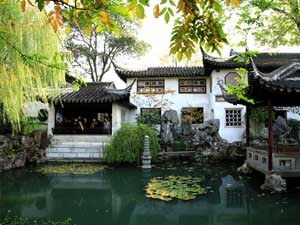 The traditional Chinese garden is a popular tourist attraction, and is a UNESCO World Heritage Site. It dates back to the 1500’s and appears to be every bit as serene today as it was then. As we took in the bonsai trees, our guide cleared up the misconception that we were looking at a traditional Japanese art in China. The Japanese took the idea for bonsai from the earlier Chinese art of Penjing, or Penzai. In fact, Bonsai was simply the way the Japanese pronounced the word Penzai. The Chinese Penzai we saw here tended to be just as dependent on naturally formed rock sculptures as cultivated trees. We stood in a forest of Penzai, and it was beautiful. We spent our last moments in Suzhou in the Lingering Garden. We lingered a couple hours—but who was counting? We could easily have lingered for hours more. The closest airfields are in Shanghai. There is one in Wuxi which is closer, however it serves basically provincial flights. Pudong Airport (IATA: PVG ICAO: ZSPD) has the most worldwide flights - 120 km (75 mi) from Suzhou . There are four significant train stations in Suzhou: Suzhou Station (Suzhou Zhan), Suzhou North Station (Suzhou Bei Zhan), Suzhou Industrial Park Station (Suzhou Yuanqu), and Suzhou Xinqu Station.